Aqua (Mineral Spring Water), Ethylhexyl Palmitate, Ceteareth-30 & Cetearyl Alcohol, Cetyl Alcohol, Glycerin, Sodium Cetearyl Sulfate, Oleyl Erucate, Dehydroacetic Acid & Benzoic Acid & Phenoxyethanol, Hamamelis Virginiana (Witch Hazel) Flower Water, Maris Sal (Dead Sea Water), Aloe Barbadensis Leaf Juice, Dimethicone, Parfum (Fragrance), Persea Gratissima (Avocado) Oil, Simmondsia Chinensis (Jojoba) Seed Oil, Prunus Amygdalus Dulcis (Sweet Almond) Oil, Triticum Vulgare(Wheat) Germ Oil, Allantoin, Salicylic Acid, Tetrasodium EDTA, Menthol, Arginine, Melaleuca Alternifolia (Tea Tree) Leaf Oil, Tocopherol (Vitamin E), Linalool, Citronnellol, Butylphenyl Methylpropional, Amyl Cinnamal, Coumarin, Alpha Isomethyl Ionone, Limonene, Isoeugenol. Love this cream...leaves my feet feeling soft and smooth...all year round. 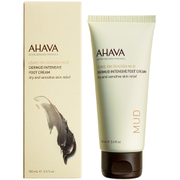 Best foot cream that I have ever used and I had tried so many before trying Ahava! So happy I finally found the one that I will use forever. I have used this foot cream for 5 years. It is the best out there. I rub it in my heels and feet every day just before I put on socks. My feet are really smooth. There is everything to like about this foot cream. I love that it absorbs quickly and doesn't leave white stuff on my socks. It is very effective. My feet feel very smooth and soft after using just two weeks. 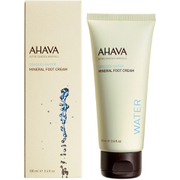 AHAVA Mineral Foot Cream---Wonderful Product! wonderful product. makes my feet feel young and rejuvenated. It smooths roughness on the heels quite quickly when you use it every night. In fact, it is better to use it i just before going to bed. I have been using this foot cream for years and continue to be pleased with results. I've been using the enriched intensive food cream, which is also very good but feels a bit greasy. The mineral foot cream feels just right and leaves my foot with a nice texture.